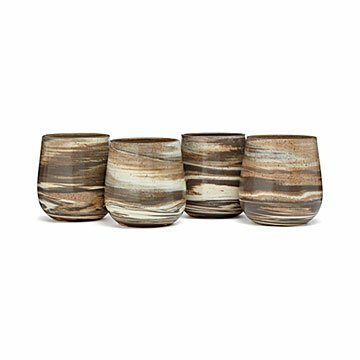 Brooke Teter and Kirsten Firlik hand-throw these earthy, swirly tumblers with three colors of clay. You may not harvest your own wine grapes, but you do have a thing for handmade: when it comes to what you sip, and what you sip from. Brooke Teter and Kirsten Firlik create these earthy, swirly tumblers with three colors of clay. As they take shape on the wheel, their unique pattern is revealed—that means each is one-of-a-kind. Give the set of four to the host who likes a good story with her Syrah. Handmade in Red Lion, Pennsylvania. Every great story starts in a basement, right? Well, Brooke Teter and Kirsten Firlik's does. Once they decided to take a chance and turn a long-time (basement) hobby into a business, it wasn't long before they needed to quit their day jobs. The duo decided to focus on doing one thing really well—elegant handcrafted pottery—and that it takes two to do it. "There isn't a piece that leaves our studio that hasn't been worked on by both of us. We work best as a team. And let's face it, it's just a whole lot more fun that way, too!" They hope their work brings a smile to your face as much as it does theirs. These are the perfect gift, they are a great size, feel good in your hand, and each one is unique! You just feel a little extra special using them.